Gold/Silver color palette heliolisk jumped out! I love the way you colored this! What kind of brush did you use to do this? It definitely has the 'ROAR' factor, and I love the pose. I love Heliolisk! Probably one of my favorite Gen 6 Pokemon....in terms of design. When it comes to combat, that Normal typing just brings him down to an annoying group of Pokemon with Normal typing that does NOTHING for them but make them weak to fighting type moves. Sure, they are unaffected by Ghost type moves, and giving Normal types an additional typing would alleviate the uselessness of Normal type Pokemon when fighting Ghost types, but that could just as easily been rectified by just teaching the Normal type some non-Normal type moves, instead of giving it additional crutches that come along with its other type. And if we did go with the latter, then Heliolisk could have just been a pure Electric type with no other problems, and would likely have been one of my favorite Gen 6 in terms of both combat AND design. I really love these pokemon works of art that you do. They're amazing and cool! My goodness this is such an appealing color scheme. Ooh, I think this might be my favourite so far. Haha, it looks like it's trying to be scary. So cute. 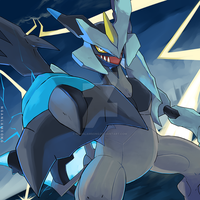 By far one of the best Gen 6 Pokemon and Electric types. He is ready to praise the sun. Oh man I love it! Love the pose! Aww he's a small cutie! !